We should all praise the day that Gin met Tonic. There’s not many marriages that have been as enduring or as zesty as theirs. Nor has there been a drink so well suited to refresh after a round of golf. Pull out your favourite bottle of Gin (ours is the Signature Dry Gin from Sydney based Archie Rose Distilling Co) and start mixing with the help of these Gin recipes. Fill a glass with ice, pour 1 part Archie Rose Signature Dry Gin and 2 parts tonic water. Garnish with a wedge of lemon and a sprig of rosemary. To try and improve on perfection, try one of Archie Rose’s limited edition seasonal gins in your next G&T. Stir 10ml runny honey into 5ml of water to make a syrup. 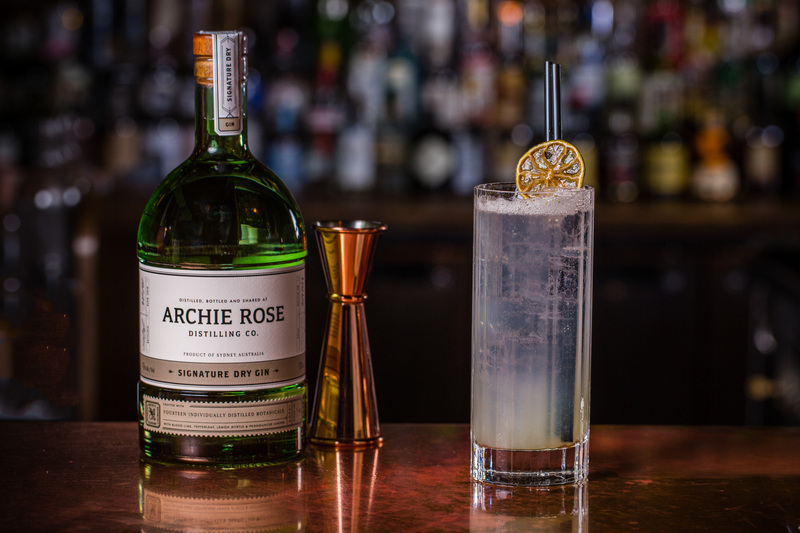 Pour into a cocktail shaker with 50ml Archie Rose Signature Dry Gin, 15ml lemon juice and ice. Shake and strain into a cocktail glass. Shake up 50ml Archie Rose Signature Dry Gin, 30ml lemon juice, 10ml sugar syrup, 1tsp sugar and 20ml lightly whipped egg white (optional) with ice in a cockatil shaker. Strain into a highball glass over ice, and top with soda water. Pour 60ml Archie Rose Signature Dry Gin, 15ml lime juice and 10ml sugar syrup into a tumbler filled with ice. Stir gently and garnish with lime zest. Stir equal parts Archie Rose Signature Dry Gin, vermouth and Campari in an ice filled mixing glass until very cold. Strain through a Hawthorne strainer into an ice filled tumbler. Garnish with a 1 inch strip of orange peel, twisted over the drink to express the oils. Stir equal parts Archie Rose Signature Dry Gin and dry vermouth with a dash of orange bitters in an ice filled mixing glass until very cold. Strain through a Hawthorne strainer into a cold martini glass. Cut a 1 inch strip of lemon peel, twisted over the drink to express the oils, then rub around the rim on the glass. Float peel, yellow side up in the martini. Pour 60ml Archie Rose Signature Dry Gin and 20ml dry vermouth into an ice filled mixing glass and stir until very cold. This cocktail should be served so cold it hurts. Strain through a Hawthorne strainer into a chilled martini glass. Cut a 1 inch strip of lemon peel, twisted over the drink to express the oils, then rub around the rim on the glass. Float peel, yellow side up in the martini. Muddle 3cm of lemongrass (if you don’t have a muddler give it a bash with a wooden spoon it will work wonders). Add 40ml Archie Rose Distiller’s Strength Gin, 10ml Honey Water (1:1 honey:water, letting honey down with water just enables it to mix well with other liquids) and 20ml lemon juice to a shaker, shake, strain into a brandy balloon (or other large glass), add ice, top with Fever-Tree Ginger Beer and add a lime wheel. This is spicy, refreshing and perfect after a round of golf. For even more Gin recipes inspiration, head over to Archie Rose’s cocktail journal. The Hosts on our Queenstown tour were a great team, giving 100% to all participants. All effort was made to ensure we all had a great time, both on the golf course and during social interactions. The courses were fantastic!!! And the dinners were organised very well. All participants from many lifestyles etc mixed well because you were so friendly and extra helpful.